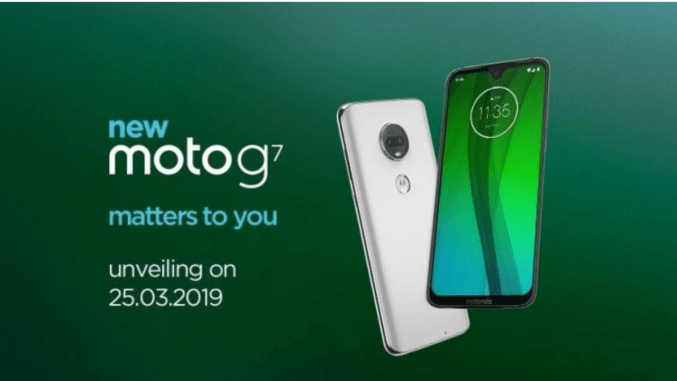 Motorola India has teased the launch date of its upcoming mid-range smartphone Moto G7. The smartphone is all set to launch in India on 25 March. Moto has already launched the G7 power last month in India, which can be purchased through flipkart and offline stores. The company has publish teaser on its social media profile indicating the launch date i.e 25.03.2019 , other than that nothing has been shared by the company. The smartphone will come with a 6.24-inches of Full-HD+ Max Vision display with 19:9 aspect ratio. The resolution of the display is 2270×1080 pixels with pixel density of 403 PPI. The display of the device is also covered with Corning Gorilla Glass 3 protection. Coming to the performance , Moto G7 will be powered by Qualcomm’s Snapdragon 632 SoC clocked at 1.8GHz coupled with 4GB RAM.As far as Storage is concerned , the device will come with 64GB Internal storage which can be further expanded up to 512GB via microSD card slot. According to reports , Moto will launch G7 in only one variant which will feature 4GB RAM and 64GB Internal storage. Talking about camera ,G7 comes with Dual Rear Camera setup with a 12MP Primary camera sensor with f/1.8 aperture along with a 5MP secondary camera sensor with f/2.2 apertures. At the front, there is a 8MP camera with f/2.2 aperture for taking selfies with some beautify modes. It will be powered by 3,000mAh battery which will also support 15W turbo Charge. Connectivity options include Dual Sim 4G VoLTE , Wifi , FM Radio , USB Type C Port and 3.5mm Headphone jack.The device will be available in two colour options Ceramic Black and Clear White color. The smartphone will also get 3D Glass built with P2i water repellent coating on top. It will run on Android Pie 9.0 out of the box. Moto G7 will compete with Redmi Note 7 , Nokia 7.1 etc Smartphones in India. ← Snapdragon 675 vs 660 Comparison review Which is better ?